With an average of 4.7 out of 5 stars from over 300 people and with the brand name Mira behind it this Mira scale is a pretty promising digital kitchen scale. If it can stand up to these great ratings we will try to tell you in the Mira Touch Professional kitchen scale. The Mira touch professional digital kitchen scale comes in 6 fashionable colors. Black, White, Blue, Red, Grey and Pink so there is always a color to match the rest of your kitchen. The tempered glass is 4 times stronger than regular glass and that could be a nice advantage. With a weight capacity that goes up to 11 lbs it will be enough for the normal household use. 3 triple A batteries are included and so is the 2 year warranty. Weighs lbs, kilograms, ounces and grams, fluid Oz and Ml. I wish there was a way to turn the beeping off. This is how the ratings are for the Mira Couch Digital kitchen scale. Click here to find the price on Amazon Like always I am very interested in the lower ratings since they might tell us something important. All the 1 star ratings were about the scale not being accurate enough. However in the higher ratings I found that a lot of people were raving about how accurate this kitchen scale is. So in my opinion it should be send back and ask for a new scale or a refund and look for an other brand. With such a low number of people complaining about that I think that is the way they should have handled it. 92 % of the people who use this scale give it a 4 or 5 star rating and that reflected in the reviews I have been reading. There are however a few things that seems to be a little flaw in this scale. The rubber feet under the scale seem to come of easy sometimes and it is maybe good to look at this and use a little glue to prevent this. Some remarks were about the scale turning of to fast, but I think that is something a lot of digital kitchen scale do. Best is to prepare all the ingredients you have to use and be prepared. The 6 x 10 inches that it measures in combination with the large numbers were feature that were very liked by many user. I comment was that someone even rinsed it lightly under the sink with no problem, but this is not recommended. This scale is not made and rated for commercial use, but I read a comment from a chef in a restaurant that he uses it every day and is very happy with it. Just a warning that this scale beeps every time you press one of the buttons. If this get on your nerves it is better to look for an other brand. The facet that it can weigh in lbs and kilograms makes it easy to use for dieting since a lot of calories are mentioned in grams in recipes. The technical features shows that this Mira scale comes with four sensors and that is something I have not seen in the other digital kitchen scale reviews we have done. 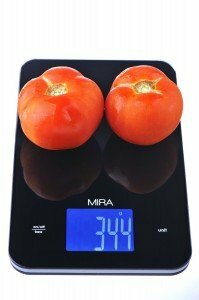 Overall the MIRA Touch kitchen scale can get our thumbs up and we can recommend it as a good buy for your bucks. Read all about what we think are the best kitchen scales for meal preparation here!